Extreeme Adventure Ltd01328 838720 work Outdoor Pursuits CentreHours of adrenaline rushing family fun (must be 10 years of age plus) which takes aerial trekking to new extremes. Swing, climb and jump at 20ft or 40ft for the more adventurous! High up in the trees there are over 20 different elements to conquer. In addition there is a 3G swing, a 80ft fan descender jump and a 1,000ft zip wire, both respectively thought to be Britain's highest and longest! For group or corporate bookings please either email us at enquiries@extreemeadventure.co.uk or telephone us on 07775593477 or 01328 838720. Please note that a 10% discount will apply, throughout the season, for parties of 12 or more persons. This discount does not apply at weekends or bank holidays. Minimum age: 10 years. Under 18's must be accompanied by a participating adult with a maximum of 3 under 18's per adult. Accompanying adults will be required to sign a disclaimer for their group. Minimum height: 1.40 metres (4ft 7 inches) - average height of a 10 year old. Maximum weight: 130 kg (20.5 stone). - A reasonable level of fitness and strength is required as the course is challenging. - Participants should wear long sleeves and trousers. - Practical footwear is essential - trainers or ankle supporting boots are ideal. 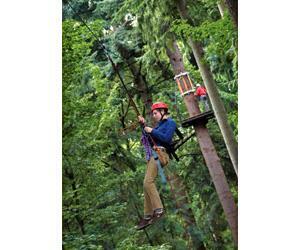 - Every participant is fitted with a safety harness, which includes a chest harness and a helmet. Helmets are colour coded to easily identify under 18's (blue), adults (red) and instructors (white). - Qualified instructors give all participants initial instruction on our training course, situated by the pavillion. This includes familiarisation with the safety harness and ancillary equipment as well as how to attach oneself to the safety wires of the ropes course. Zip Wires: the 300 and 1,000ft zip wires are both very fast. In both cases an instructor is at the start of the zip wire to ensure that the participant is attached correctly. The participant ends up about 10ft above the ground and then uses a descending device, called a "Grigri" to control their descent to the ground, under the supervision of another instructor. The "Grand Fir" 85ft platform. This takes 3 instructors to operate. One at the base of the tree to operate the electric winch and ensure that the participant is correctly secured for the ascent; one on the 85ft platform to ensure that the participant is secured correctly to either the fan descender or the 1,000ft zip wire. The third instructor is at the end of the 1,000 ft. zip wire to ensure a safe descent to the ground. All participants must sign a disclaimer. We are on the A1065 8 miles North of Swaffham and 8 miles South of Fakenham. Large signs on the A1065 in the Weasenham Woods indicate the turning off the main road. The car park is only 400 yards from the crossroads.